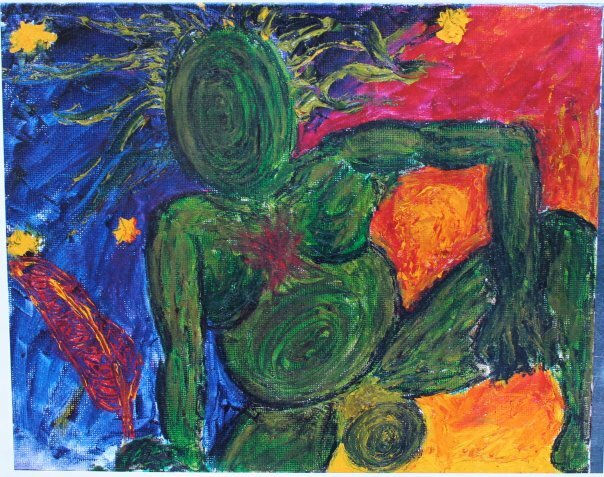 Radwoman is the name inspired by the Sacred Feminine images of my visual art work. Radwoman is a modern, version of an all-encompassing, timeless, feminine principal. She is a non-denominational deity. She is life-force, death, creativity, and destruction all at once. She is receptive and active at the same time. She is my inspiration. It was in a dream that I saw the first image of Radwoman to be drawn… I dreamt that I was running through the city streets. I looked down near the base of a small tree and saw a wood round, as if a slice had been cut right through without harming it. On the wood round was a drawing of a woman, with fire underneath and rays of light coming out from behind. Her face was a spiral and her hair was full of energy, lifting out in all directions. In my dream I gave this “wood-chip woman” as I called her, to a woman I recognized from my waking hours, but had not yet met. Eventually met that woman in really life, told her of my dream, and gave her the wood-chip woman. Fifteen years later she is very dear to me and close to my heart and art. Radwoman is still coming through and I am in deep appreciation every time I am inspired to draw or paint a new vision of her.